The method began in Japan, and was, by the early twentieth century, the predominant brew method. A flannel filter attached to a metal hoop creates a small bed in which coarsely ground coffee—nearly twice the amount of a single origin pour over—sits. Then, tepid water is poured at a glacial rate over an indentation in the grounds. Why the evergreen admiration among a certain set? One taste of the velvety wine-like extraction, often made from coffee grounds at least a month old, provides the answer. We sat down with Bryn to glean a few key tips to achieving an ineffable cup. Read these pro-tips to improve your method, or refer to the full brew guide for step-by-step instructions. In a time when freshness is paramount, Bryn sees the Nel Drip as “a way to continue the life of a coffee” that would be deemed too old for any other method. So grab a coffee that's one-, three-, or six-months past roast date. Have a handful of beans from a two-year-old Gesha? Try that too. Once you’ve made your first nel drip coffee, rinse the filter well (do not use soapy water). Store the nel filter in a clean plastic bag in the fridge. If planning to use the filter only occasionally, consider freezing it in the plastic bag instead. 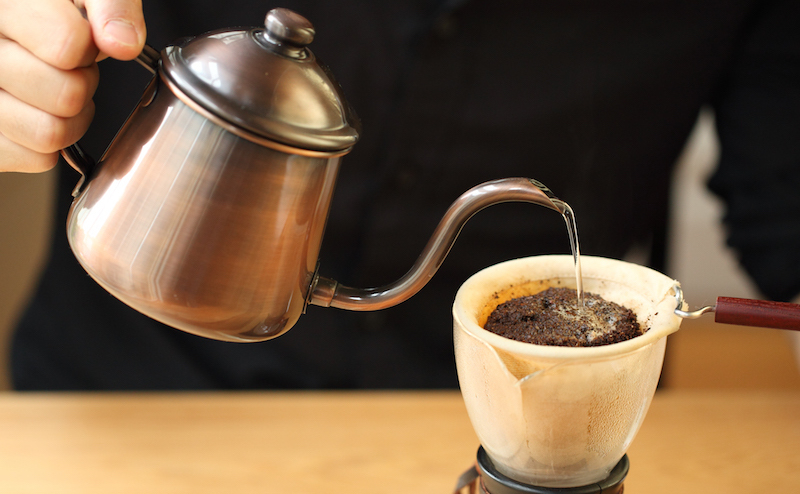 Nel drip coffee is a dramatic under-extractraction because of the pour technique, the coarseness of the grind, and the relatively cool water—175℉, compared to the typical brewing range of 195℉ to 205℉. To maintain relatively stable temperature, pre-warm your filter and nel pot by pouring water into the filter until the pot is full. Grind the coffee, assemble your tools (scale, timer, and metal spoon or butter knife for shaping coffee), and wring out excess water from the filter and empty the nel pot. Finally, place the filter over the carafe and add the coffee. If you’re without a thermometer, use this rule-of-thumb: water cools about ten degrees every minute (in a closed kettle that’s appropriately sized for the amount of water). That means boiling water will reach the right temperature in about three-and-a-half minutes. Before serving the coffee, pre-warm the cups by pouring hot water into each cup, and emptying just before the coffee is ready to serve. The key to a successful nel drip is in the slow pouring technique. Bryn likened the initial pour to “a string of pearls,” a drip, drip, drip. The second and third are like a slow and steady stream. It's said that masters in Japan manually taper the spouts of their cruet-sized kettles, but any swan neck kettle will do. The important thing is to be familiar with your kettle. Know how it pours when there’s a lot or a little water in it. To keep your pour as steady as possible, maintain a consistent water level. Bryn cautions that trying to match your pouring rate to a timer can be daunting. Forgetting to breathe is one of the ways to sabotage an even rate. This is a method that requires practice, patience, and hawk-eyed focus. So inhale and exhale gently, and know that there are many opportunities to get this right.